James Henry Beale was born 16 May 1848 at Sandy Bay, Tasmania, the son of James Henry Beale and Margaret Munro. He married Margaret McPherson (1851-1920) 3 June 1869 at Sydney, NSW, and they had five sons and five daughters. Beale died 25 October 1924, aged 71 years, at his home “Runnymede”, 17 Pacific Street, Manly; he was interred in the Presbyterian Section of Manly Cemetery. He left no Will. James Henry Beale lived on Raglan Street, Darlington and also on Regent Street, Camperdown. James Henry Beale was one of the largest property owners in the Borough of Camperdown. He was the first president of the Newtown United Friendly Society’s Board. James Henry Beale was one of the prime movers in bringing about the system of sewage to Darlington. During his period as Mayor, Council assisted the newly formed Darlington Volunteer Fire Brigade by granting the brigade with a piece of land upon which to establish their premises. He was for some years chairman of the committee of management of the Newtown Presbyterian Church and he liberally subscribed to nearly all the public charities of Sydney. James Henry Beale was an alderman on Darlington Council in 1878-80, 1883-87 and 1890-96. 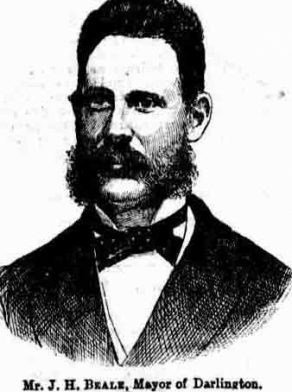 He was mayor in 1887 and Returning Officer in 1895.